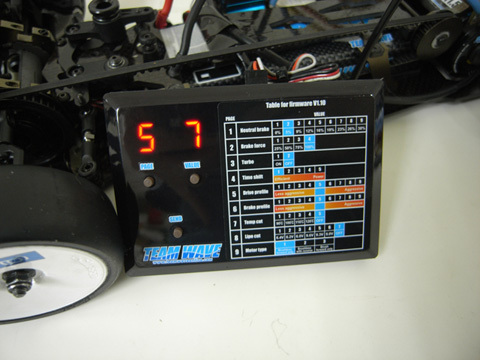 Team Wave is releasing a new brushless speed controller coded "RB-50" (Racing Brushless system 50). This speedo is the smallest sensored brushless controller in the market with highest power and functions. We hope to release to the market in May/2008. More photos and information will be available next month. RB-50 is not OEM from any company, it is 100% developed by TEAM WAVE, we have spend 2 years and lots of money in developing this speedo, we hope to deliver the most sophisticated speed controller to our customer. Mais par contre sur leur site je le trouve pas. Normal, pas encore disponible, pour mai! A 1500u super low resistance cap is included (1/10 resistance of super cap)"
RB-50 is designed for racing, your brushless motors will come alive with the ability of this controller. This controller will definitely give you new driving experience, high top end speed smooth cornering and high punch." "A thinner version will be available for 1/12 after RB-50." enfin!!!!!! je sais pas ce que vaudra le reste, mais enfin un vario qu'on peut mettre a jour soit-même, il est temps! "Time shift" is a kind of motor timing technology, the actual name should be "Phase shift". It will shift the motor phasing by software means. "Turbo drive" is another new technology which can give you 10% more rpm on the straight. The middle FETs are cooled by our "Direct flow" technology in which cool air are directly blow into the center of the ESC and hot air escape at the back of the ESC. RB-50 is not ready yet, please wait for 1-2 months. Ca yest ça commence à ce préciser! Il me semble quand meme qu'il y a 200A d'ecart avec le speed passion en pointe non? Je vous presente un des premiers RB30 (le RB50 n est pas encore finalisé) de chez Team-Wave arrivé en France que j'ai actuellement monté sur un TC3 pour essai. et apres perso je trouve tres sympa son boitier un peu plus petit que le Sphere, son systeme de reglage par un seul bouton et son interupteur qui inspire la confiance, le seul bemol concerne le condo livré d origine qui est un poil petit et qui merite d etre changé des le depart par quelque chose d'un peu plus serieux. , Team Wave devoile officiellement ces deux variateurs BL, le RB-50 et le RB-30. As an innovative RC electronic developer, TEAM WAVE has devoted tremendous resources in developing new products. After the successful Lightning V2 discharger, we are happy to introduce our latest release: Racing brushless speed controller series RB-50 & RB-30. 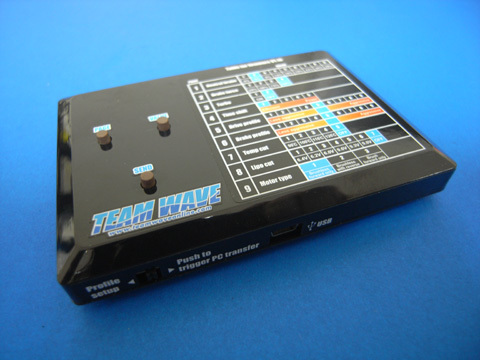 Compare with traditional sensored brushless system, TEAM WAVE raised the technology to the next level by introducing the Time Shift technology - motor timing is no longer fixed in sensored brushless system. Together with our Turbo Drive technology which gives an instant extra boost to the motor at full throttle, smoothness and high top-end speed can now be achieved at the same time! Smooth throttle and brake responses are the keys to fast and consistent lap time. 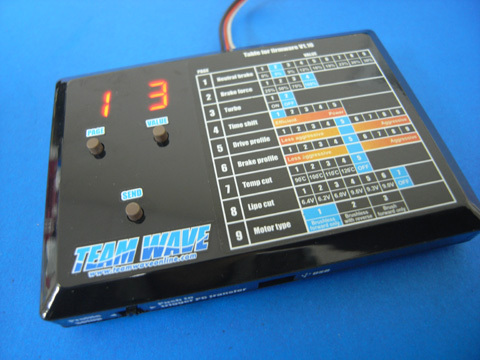 All TEAM WAVE racing brushless controller features 10-bit resolution in both forward and brake mode, i.e. 1024 steps for forward and 1024 steps for brake! Together with 9 throttle and 9 brake curves, there is always a profile that suits your driving style. The size of the controller is not compromised for high performance in the RB series. By utilizing high density multilayer multistack PCB, RB series brushless controllers provide enormous power to today's high-drain motor and at the same time features an ULDO (Ultra Low Drop Out) BEC (Battery Eliminated Circuit) which can deliver 3A continuous current without significant voltage drop (BEC output 6V at normal and over 5.6V at 3A load). Your expensive steering servo can now work at full force and won't loss power/speed at high traction tracks or quick chicane. In RB50, a high power cooling fan is installed on top of the controller. A specially designed ventilation hole is drilled through the heatsink such that cool air can be blown directly into the controller to cool down the lower stack MOSFET and the hot air can then escape from the back of the controller. The heatsink is strategically shorter than the cooling fan such that cool air can also reach the bullet connector at the back for further cooling. Every component used in the RB series is carefully chosen and specially designed with high quality and fidelity at a reasonable price. All components are imported from the original manufacturer and all controllers are designed/made in Hong Kong which ensures highest quality. Our passion is embedded in every design detail and no other OEM products can compare. Both RB30 and RB50 are capable to update firmware through the optional handheld programmer. The handheld programmer not only provide easy setup of the controller but also features a USB link. With updateable firmware, you can enjoy all new features later without paying extra! All brushless controller comes with a power capacitor and a full colour instruction menu. RB-30 comes with high quality 14AWG wires (five colours) and RB-50 comes with TEAM WAVE ultra flex 12AWG wire (black) and coloured shrink wrap. Michel tu as toujours ta TC3? ?